This side table is a classic combination of geometric and mirrored surfaces and will be a stunning addition to any room decor. Made up of acrylic and glass, lustrous silver finish mirror panels with crystal accent on sides gives a beautiful appeal. 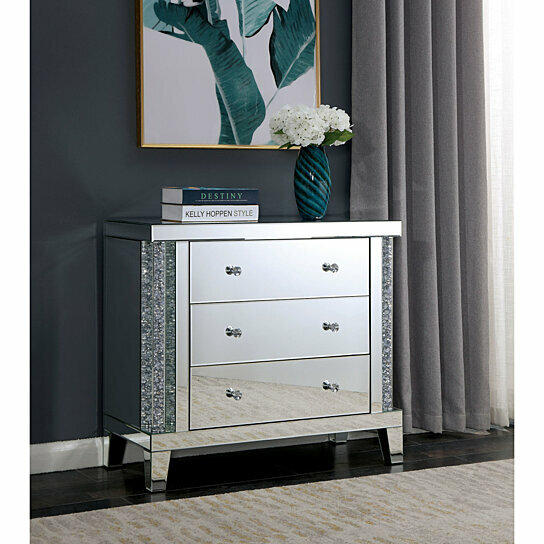 This side table consists three spacious drawers with attached acrylic double diamond shape pull for each drawer. This eye-catching piece can also be used in master bedroom decoration or living room solution.